See more objects with the color darkolivegreen darkseagreen darkslategrey darkolivegreen wheat or see all the colors for this object. This is a Sidewall - sample. It is dated 1906–08 and we acquired it in 1985. Its medium is machine-printed paper. It is a part of the Wallcoverings department. 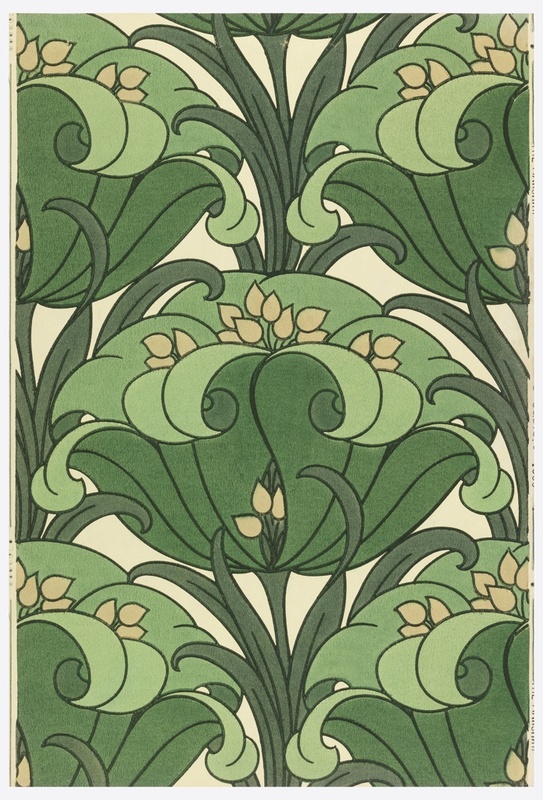 American art nouveau design with a large-scale floral motif filling the width of the paper. While there are no highlights or shadows the overlapping of elements does impart a very shallow sense of depth. Earthy colors such as green, brown and tan were popular in the early twentieth century, as were blue, red and mauve. 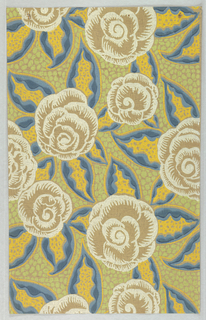 It was common for wallpapers at this time to contain deeply saturated colors, due in part to the discovery of synthetic dyes a few years earlier.